A new buzz word in food manufacturing is simple. Manufacturers have caught on to the idea that consumers want less ingredients and less processing. They want to recognize what is in their food and where it comes from. And I have to admit I am swayed. Walking down the grocery aisle the last time I went shopping (I am on a shopping hiatus) I wanted to get some ice cream to make ice cream sandwiches. I didn't have a lot of time or energy to do much from scratch so making homemade ice cream was not an option at that moment. 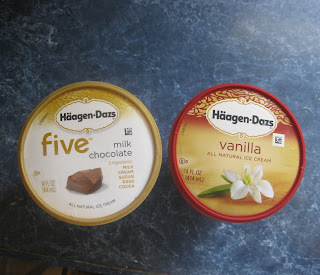 So I walked down the vast ice cream aisle trying to decide the best route to go and spotted Haagen Dazs. They have a new line of ice cream called Five. The ice cream only has five ingredients in it. I grabbed the chocolate flavor and put it in my cart. I also needed vanilla, but couldn't find Five in vanilla flavor. Not wanting to spend a lot of time searching through ingredients lists, I just grabbed the regular Haagen Dazs vanilla and I was on my way. Now at my grocery store, Shoprite, they happen to be the same price, but I know that if the Five was stocked and cost more, I still would have bought it. Although my ultimate goal will be to make homemade ice cream, my future store-bought ice cream experiences will include reading the label and not being swayed by clever marketing.